NHA has wide experience of producing educational marketing material for schools and colleges. This ranges from prep schools to 6th form colleges and includes school magazines, the school prospectus, school journals and course programmes – some schools feel that sophisticated and elegant is right for them, others feel child-centric is more appropriate. We do both. Often the first point of reference when choosing a school or college is the school prospectus but a school magazine should be equally influential. First impressions count so from a design point of view it’s important to project the right message. This can vary hugely and there is no “correct” strategy other then being truthful and, of course, scrupulously careful about data protection. The design for your school magazine is just as important as the prospectus for transmitting the achievements of your school but there is a far greater opportunity to present the "emotion". School magazines come in two basic varieties: those mostly designed and produced in-school by teachers and (sometimes) the kids working together; or, those where the material and content is sourced around the school, with the design, etc left to an outside agency. We deal with both. 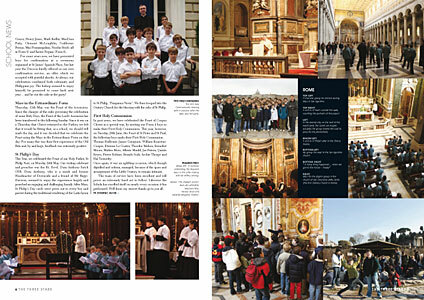 Here, for example, are spreads from two very different magazines we produce for prep schools. You'll find more examples of our school and college expertise here >>. To discuss how NHA might be able to help you, talk to Neil Hitch on 020 7436 3565 or email him. The best brochure design relies on far more than just good design: strategic thinking, good photography, focused copy and astute printing knowledge are equally important to the overall impact and success of any brochure design project. Scratchcards provide a totally flexible solution to many promotional requirements. The promotion can be tailored to dovetail exactly with your marketing aims whether it's incentivising a sales force, attracting visitors to an exhibition stand or simply raising awareness of your product.